This Costume Halo Crown from Dallas Vintage Shop is just one example of the huge collection of Religious Costume Accessories and Complete Costumes we keep in stock. Find all the Iconic Church Liturgical Attire and Famous Religious Characters Outfits imaginable for Historical Religious Ministers, Priests, Saints & Bible Characters. 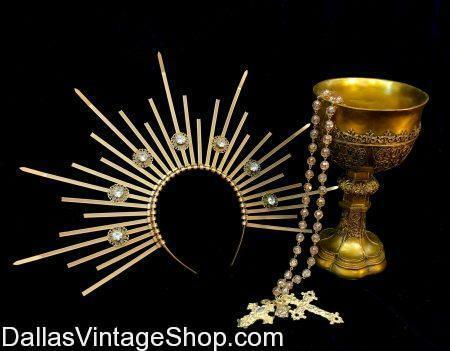 You can count on Dallas Vintage Shop to provide Classic Ministerial Attire and Religious Costume Accessories for Theatrical, Film, Historical Reenactment Events and Costume Theme Parties. These Iconic Religious Saints & Angles Sunburst Halo Headpieces, shown here, are impressive costume pieces. We have Complete Outfits & Accessories for Religious Icons, Historical Church Leaders, Ministerial Attire, Priests Robes, Angels & Saints Aura Halo Headpieces and Religious Holiday Costumes for Pageants, Plays, Film or Historical Projects. Find Iconic Traditional Church Ceremonial Costumes and all the Religious Costume Accessories you can imagine. From Protestant Church Fathers and Martyrs to Jewish Rabbis and Historical & Biblical High Priests, we have the Religious Garb you need. Get all the Iconic Catholic or Orthodox Priests Robes, Famous Historical Religious Characters Iconic Garb, Religious Holiday Traditional Character Costumes, Classic Biblical Characters, Angels and Villains of the Bible and all the Accessories that go along with each and every costume. This entry is filed under Clerical. You can follow any responses to this entry through the RSS 2.0 feed. Both comments and pings are currently closed.